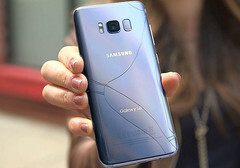 A team of researchers from the University of Tokyo has just developed a new type of glass that could finally allow phone manufacturers to build handsets like the iPhone X or the Galaxy Note 8 with shatter-resistant back covers. Although glass panels look much better than their metal or plastic siblings, they have a major issue: they shatter easily, and sometimes this unfortunate event cannot be avoided with the help of an average protective cover. Fortunately, a recent discovery by a Japanese team might make go away this issue sooner than expected. As it often happens with great discoveries, the new material was discovered by accident. According to The Guardian, "The properties of the polyether-thioureas glass were discovered by accident by graduate school student Yu Yanagisawa, who was preparing the material as a glue." When the surface of this polymer develops cracks, the user simply needs to compress the edges for 30 seconds at 21 degrees Celsius. Once the crack is "healed," it only takes a few hours for the original strength of the material to return. Earlier this year, researchers at the University of California also developed a self-healing polymeric material that could stretch 50 times its original size and needs 24 hours to heal breaks. However, the type of self-healing glass based on the material discovered by the team from the University of Tokyo that we mentioned above promises to deliver even better results. It only remains to see how long does it take for the first Apple iPhone X-style glass cover with self-healing capabilities to show up.